The people on these mystery pages are people in photographs that have not been completely identified. Please contact Susan T. Miller if you know, or even have any clues to, the identity of these individuals. This picture is from the collection of RobRoy McGregor. The lady is identified as "Mrs. A. Thurtell" in the handwriting of Julia Mary (Mate) Snow Thurtell. 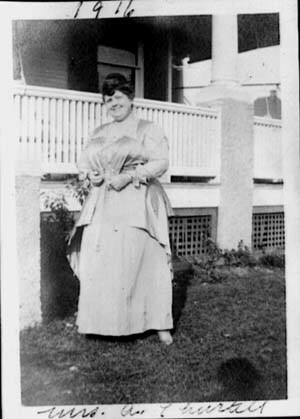 She is standing in front of the house belonging to Henry and Mate Snow Thurtell at 1217 Delafield Place, NW, Washington, DC. The picture was probably taken sometime in 1916 based on the date on the picture. Can you identify this lady? 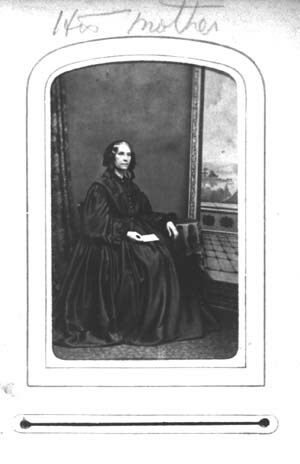 This lady is identified as "his mother" and is from the collection of Charlotte Mackie. The picture was probably taken before 1900. Can you identify this lady? This page was last updated October 9, 2000.